The cloven-feathered dove is found on New Caledonia, an island chain located roughly 1000 miles east northeast of Australia. This bird is one of over 300 species of pigeons/doves. The term "dove" and "pigeon" are used interchangeably, although smaller species are more likely to be called doves. They are stout-bodied birds with short necks and short slender bills. The plumage of the cloven-feathered dove is green in color, and there are white and dark green bands that appear on the wings and rump. Its breast is also green, and a yellow patch appears below the breast with a black and white band just above it. Its underparts are yellow and gray, and it has white fluffy anklets that stand out and are unique to the species. They can grow as large as the common pigeon which weigh up to 12.5 ounces and measure between 12.2 and 13.4 inches long. The cloven-feathered dove is restricted to humid forest, where much of the original forest cover of New Caledonia has been lost. Little is known about the behavior of this species. Pigeons and doves can be solitary to very social and can be found in flocks of several thousand. They are generally diurnal (active in the day). Pigeons and doves are known for their navigation abilities and have been used by humans as messengers. Diet generally consists of grain and seeds, and some dove species, including the cloven-feathered dove, are fruit eaters. Pigeons and doves are monogamous, meaning they remain as mating pairs from year to year. Female fruit-eating doves generally give birth to one egg, and usually both parents help to incubate the egg. Incubation may last from 11 to 30 days. Recent studies estimate the population of this species to be 140,000 birds. Threats to the species include hunting, and loss of habitat due to fires, logging, and mining. The species was listed as endangered in 1970, but very few additional conservation measures have been implemented to preserve the species. Copyright Notice: This article is licensed under the GNU Free Documentation License. It uses material from the Wikipedia article "Cloven-feathered dove". Glenn, C. R. 2006. 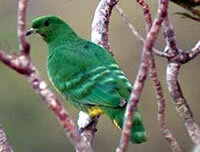 "Earth's Endangered Creatures - Cloven-feathered Dove Facts" (Online). 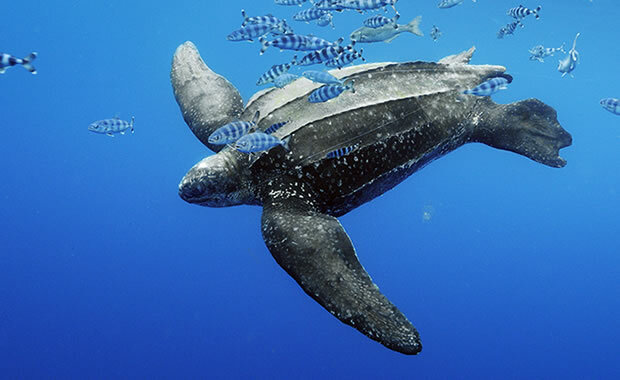 Accessed 4/22/2019 at http://earthsendangered.com/profile.asp?sp=128&ID=4. Need more Cloven-feathered Dove facts?